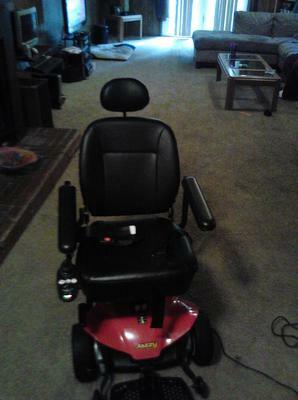 The Jazzy Select Elite Scooter for sale has a seat with a tall back and a headrest and larger footplate that goes a long way toward keeping you comfortable while riding. The charging port on this mobility scooter is easily accessible on the controller and the in-line technology provides stability and a tight turning radius. We invite visitors that stop by to write a review of the used mobility scooter or to share any thoughts and/or opinions to make potential buyers aware of any problems that are commonly associated with this brand or to highlight its positive features and help our visitors make informed decisions. The Jazzy Select Elite Scooter is in Seguin near San Antonio TX Texas! My asking price is a very cheap $425 which is a very good value for a nice one like this so contact me before the mobility scooter is gone and don't forget to mention that you found this ad on GoGoCycles Motorcycle Classifieds www.gogocycles.com using the comments forms located on this page. REQUIRE HEAVY DUTY DELUXE FOUR WHEEL SCOOTER TO PURCHASE + ESTIMATED FRT. TO NOVATO CALIFORNIA 94945 CA.